Finnish Universal horses, also known as Finnhorses, are consider the breed capable of fulfilling all of Finlands horse needs, including agricultural and forestry work, harness racing, and riding. They are found in Norway, Sweden, Finland, and Denmark.The Finn people are rather proud of finnish Universal horses as they have been given the reputation as being some of the fastest in history. During the Bronze Age there were definitely horses roaming around, but it has been rumored this was one of those styles. The local army utilized the breed over and over again on various tasks and missions. Once the studbook was created in 1907, they were outlawed to perform anymore out crossing. That studbook went on to be divided into a few sections, one for riding, one for trotting, one for drafting, and one for ponies. 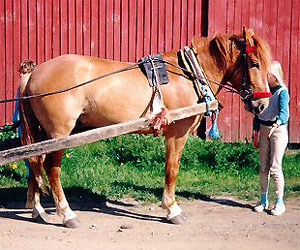 Finnish Universal horses are considered to be very kind, willing, eager, and docile creatures. They are easy to care for, no major health issues reported, and they can reside in virtually temperature climate. They are 15 hands tall. They have a well shaped head, a powerful neck, strong shoulders, quarters that are filled with muscles, clean and lean legs, and very little feather. They have a very long stride and a long body that looks very graceful when they are trotting.